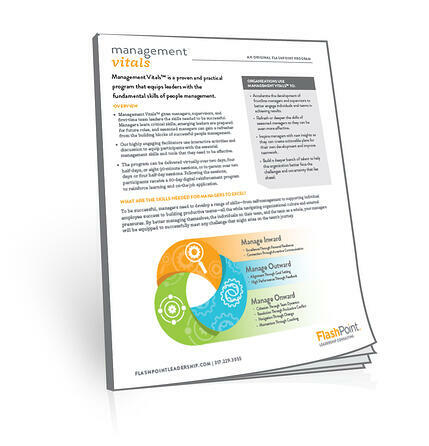 Management Vitals™, a FlashPoint original program, is a proven and practical program that equips leaders with the fundamentals of management. This modular program is designed for first-time team leads, supervisors, managers, emerging leaders moving from individual contributors to people leaders, or seasoned leaders who need more depth or a refresher in the building blocks of management. Fill out the form to download an overview and course catalog. We'll also send you a copy by email.